Cardinal George Pell of Australia has been staying for some time at his Roman holiday home, the palatial $30 million “Domus Australia, getting in, according to press reports, some serious “reading”, among other things. 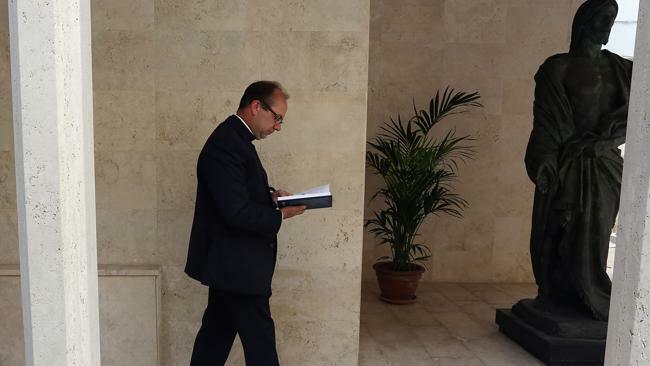 Last month, he took time off to accompany World Youth Day “pilgrims” to Lima and Rio, so he lost some reading time. Fortunately, his stand-in did some for him (pictured below at Domus Australia), keeping the Cardinal-spotting tourists happy. 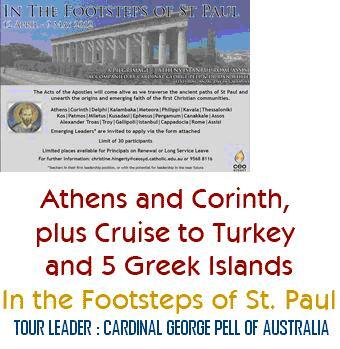 Now, George is taking a longer break from reading to go on a lengthy tour following in the supposed footsteps of St. Paul. This means he will need even more catch-up with the reading schedule. Fortunately, a reading team (pictured below) has been assembled for the task. It is probably a good thing that George has been taking a couple of breaks from reading, since he may be getting a little short-sighted and risking eye strain as this photograph indicates. As with his South American trip, George will have to rough it a bit, compared with “Domus Australia”. The brochure for the new trip from Harvest Travel Agency, refers only to “luxury, 4-star accommodation”, during the tour, not 5-star. However, the cruise ship is really cool! George is no stranger to being a tour guide for this junket from Harvest. Last year, he took a group of 40 young teachers on the trip through Italy, Greece and Turkey. They even stopped at Anzac Cove for the Anzac Day ceremony, although it is unlikely that St. Paul ever went there. It was off the track a bit, but the Prime Minister, Julia Gillard was there, and George had the opportunity to give a little speech in which he noted that the Anzac story “had improved the standing of his church.” The 2009 trip included Brisbane Archbishop, Mark Coleridge. George had previously been due to go on the tour with World Youth Day pilgrims in 2005, but had to cancel at the last minute because of fears of “terrorist attacks” in Turkey. Perhaps it had something to do with his comment at the time about the Koran being “riddled with invocations to violence.” Hopefully, all has been forgiven, and most importantly, forgotten now. Here, we see George with last year’s pilgrims, including an audience with the Pope. What travel agency could compete with this billing. There are many, many other agents offering the tour following in St. Paul’s footsteps. There are also many other Christian denominations who do the trip. For example, last year he risked crossing paths with Salvation Army pilgrims, led by Lieut. Colonel Brian Hood, the third such tour for officers from his territory. This year there is the possibility of the same with the group of Lutheran pilgrims led by Pastor Lee Joesten. It can get quite crowded on St.Paul’s pathway. Anyway, happy prilgrimming, George. Hope to see you back in Oz soon, at the Royal Commission. 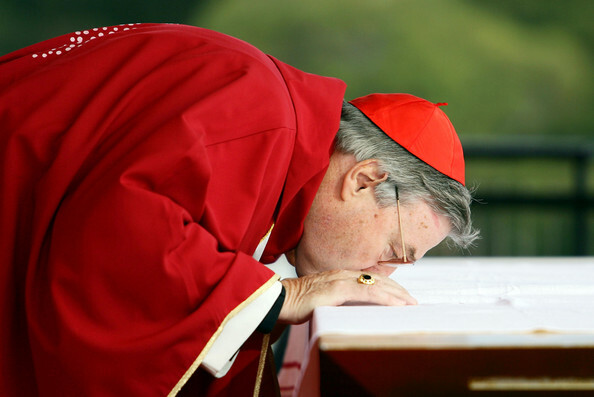 This entry was posted in Uncategorized and tagged Australian royal commission into institutional response to child sexual abuse, Brisbane Archbishop Mark Coleridge, Cardinal George Pell, Catholic Cardinal George Pell, Domus Australia, Dr Dan White, George Pell, Harvest Pilgrimages, Harvest Tours, Julia Gillard, Lewin Blazevich, Lewis Blayse, Lieut. Colonel Brian Hood, Mark Coleridge, Pastor Lee Joesten, Pope, Salvation Army, World Youth Day. Bookmark the permalink.